Technologist portal – the place where tech will be able to view studies he submitted, process them automatically or manually with assistance from EMSOW, attach additional documents and download finalized reports. By default, each tech will see only studies submitted by him, with the option to see all DICOM studies on the domain. ‘Received on:’ search for studies that have been sent on the specific date or range of dates. 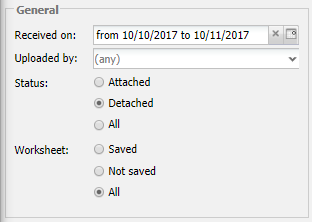 ‘Worksheet:’ option to search for DICOM studies that have the worksheet ‘Saved’ / ‘Not saved’ / ‘All’ when you do not care. Search with the query in this section will ignore options in all other sections. ‘Study UID:’ search for DICOM study based on the DICOM study uid. The section that in which you can search for the specific patient by demographics data that are inside DICOM. Note that if the last name of the patient in DICOM contains a mistake – you would not find anything if you will be searching by the last name without the mistake. ‘Study date’ search by date of service that was added on the equipment. ‘Reading doctors:’ search by reading doctor name that was added on the equipment. 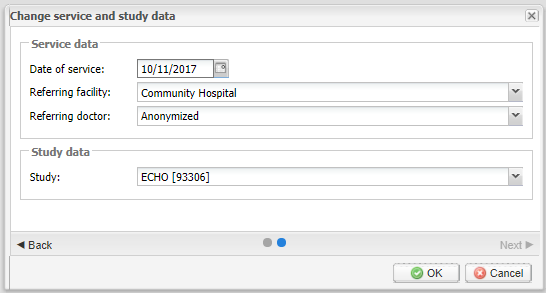 ‘Reprocess as new’ – for the clients that did not use the schedule in EMSOW and creation of the studies should be done manually or by EMSOW based on the DICOM information. ‘Reprocess step-by-step’ – will open the interface that allows user manually provide all necessary information to create a service. It will be described in detail in the section “Reprocess step-by-step (Reprocess (steps))” of the manual. Each tile represents one DICOM study. 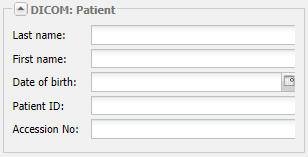 Patient demographics on the tile retrieved from DICOM study information and would not change after the study have been attached to the EMSOW service. In the right upper corner of each tile, there is the checkbox that user should use to select study to perform actions from the menu bar. Some of the most commonly used menu options we copied onto the buttons that will appear only when the user hovers its mouse over the tile. This buttons is totally optional and can be disabled. ‘Reprocess (steps)’ – will open the interface that allows user manually provide all necessary information to create a service. It will be described in detail in the section “Reprocess step-by-step (Reprocess (steps))” of the manual. In the right bottom corner of the tile, we place four icons that will provide some crucial information about the study. Those icons highlighted on the image above. 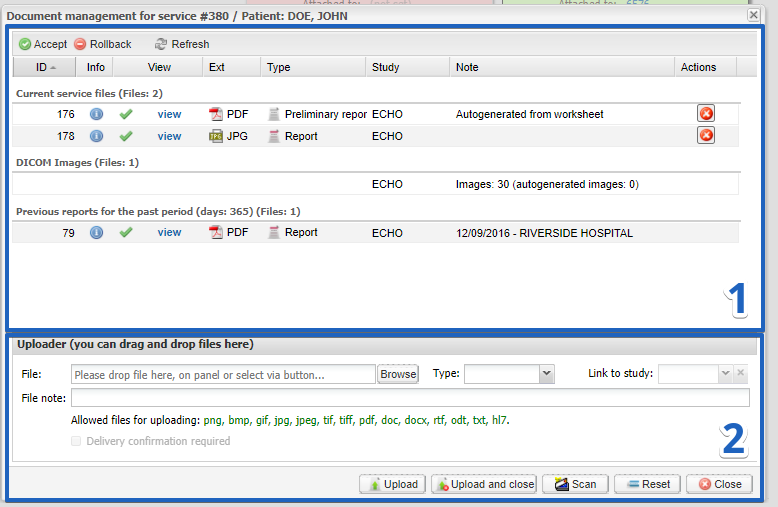 ‘Cache status’ – if a DICOM study is available right now to be viewed the icon will have a green tic. After 7 days from the date when the study has been received we place the DICOM study in long-term storage. In that case, the icon will have a red cross. ‘Uploaded by’ – this icon will provide information by whom the study was uploaded into the system. ‘Report indicator’ – Red transparent cross if there is no report for the study. Green tic if there is a report added to the study. 2) Uploader – interface where you can upload select documents that you want to attach to the study, select their type and leave a note about the document. 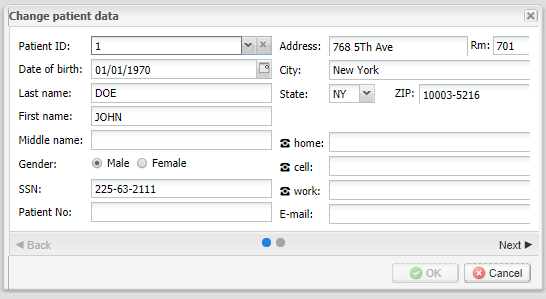 At second step you verify Service data such as DOS, Referring facility, and Referring doctor and type of study.